The Konnekt Videophone makes it easier, caring for senior parent or parents who are living alone, living independently or simply too far away for you to visit every day. 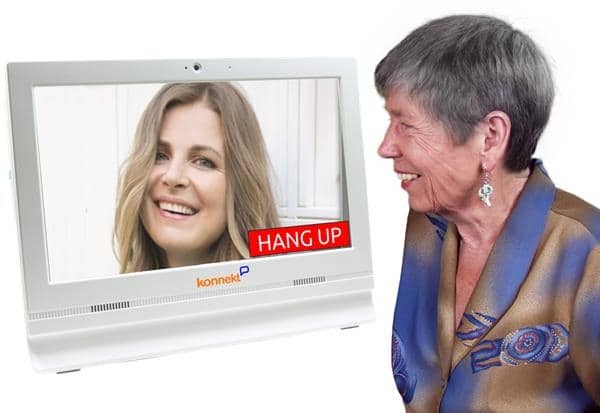 Our Videophone is designed to give your elderly mother or father a better quality of life. Seniors can SEE family and friends as often as they like, without the travel. They are able to live independently but still be part of the family. They can feel closer to relatives during vacations, at special occasions, and any time they can’t be there in person. They can watch their grandkids grow, talk face-to-face to loved ones as often as they want, and bring a smile to distant family who live interstate or overseas. For sons, daughters and care-givers, you can visit your senior parent “virtually”, from the comfort of your own home – during their meal times, when your grandkids are playing games, or even while watching TV or cooking. The Konnekt Videophone is incredibly EASY, with one-touch to call or answer. It’s LOUD, has large call buttons and a big 15-inch screen. 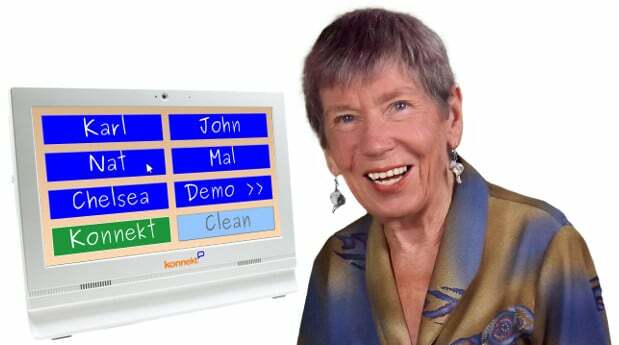 To make a face-to-face call to their grand-daughter “Abi”, your senor parent simply has to TOUCH the huge “Abi” button on the screen. That’s it! Within seconds, they’ll see and talk to each other as if they were in the same room. There are no numbers to remember. No computer skills are required, whatsoever. There’s no keyboard or mouse, no logins or password. There’s nothing to carry round, charge up or hold onto. It’s just ON, like their favourite old telephone – but MUCH simpler to use. For older adults the probability of developing symptoms of depression steadily increases as the frequency of in-person social contact decreases. Our research showed that such an effect did not exist for phone, written, or email contact. What does this mean? Social isolation is bad for your mental health, and regular face-to-face social interactions are likely a great way to help prevent depression. Set their phone to ring for 55 seconds rather than the default 25-30 seconds. Fill a digital photo frame with family faces, with the name in HUGE text. Use visits for fun outings, food, friends, art, movies, talking. If you do chores, you’ll both resent visits. Consider an emergency pendant. However, 80% of the elderly don’t wear them! In an emergency, look in with Videophone auto-answer. SEE what’s wrong, comfort them and talk. Download our articles about caring for senior parent or parents here, or learn more about Videophone.